The military has been warning Congress that if no spending deal be about the hollowing of the force should no deal be reached in Congress over cutting federal spending. 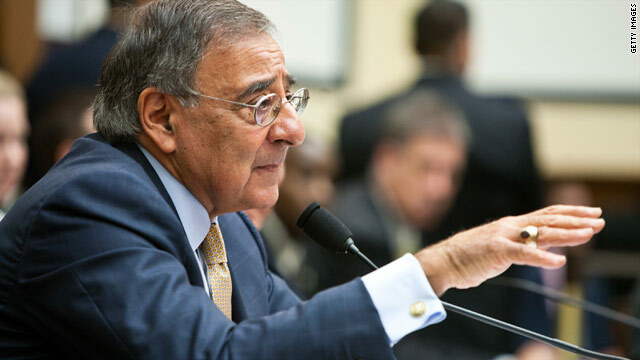 Now, a day before Secretary of Defense Leon Panetta appears at a Senate Armed Services Committee hearing which is theoretically about the withdrawal from Iraq, the defense secretary has sent the most detailed look yet at what would be impacted further defense cuts. The details, in response to a request for information from Senator John McCain (R-AZ) and Sen. Lindsey Graham (R-SC), outline the potential for significant reduction including "equal percentage cuts in every weapons program, research project, and military construction project." Panetta warns that the U.S. "would have to formulate a new security strategy that accepted substantial risk of not meeting our defense needs." I am responding to your recent letter asking for more details about the effects sequestration would have on the Department of Defense (DoD). Like you, I believe it is essential that the Joint Select Committee on Deficit Reduction (JSCDR) meet its target and avoid sequestration. I also strongly urge the JSCDR meet its target while following the President's proposals, including his recommendation not to impose further reductions in the caps on discretionary funding. If the JSCDR fails to meet its targets and sequestration is triggered, DoD would face huge cuts in its budgets. Compared with the President's budget plan for FY 2012, we are already planning on budget reductions over the next ten years of more than $450 billion. These cuts are difficult and will require us to take some risks, but they are manageable. If the maximum sequestration is triggered, the total cut will rise to about $1 trillion compared with the FY 2012 plan. The impacts of these cuts would be devastating for the Department. The enclosure outlines some of the potential effects, which are summarized below. In FY 2013, the reduction in defense spending under maximum sequestration would amount to 23 percent if the President exercised his authority to exempt military personnel. A cut of this magnitude would be devastating in itself, but it gets worse. Under current law, that 23 percent reduction would have to be applied equally to each major investment and construction program. Such a large cut, applied in this indiscriminate manner, would render most of our ship and construction projects unexecutable - you cannot buy three quarters of a ship or a building and seriously damage other modernization efforts. We would also be forced to separate many of our civilian personnel involuntarily and, because the reduction would be imposed so quickly, we would almost certainly have to furlough civilians in order to meet the target. These changes would break faith with those who maintain our military and seriously damage readiness. The situation does not get better beyond FY 2013. In this period, cuts to the DoD budget under maximum sequestration would equal about $100 billion a year compared with the FY 2012 plan. Facing such large reductions, we would have to reduce the size of the military sharply. Rough estimates suggest after ten years of these cuts, we would have the smallest ground force since 1940, the smallest number of ships since 1915, and the smallest Air Force in its history. We would also be forced to terminate most large procurement programs in order to accommodate modernization reductions that are likely to be required. While wartime funding in the Overseas Contingency Operations accounts is not directly affected by the sequester, war efforts would be adversely affected by the severe disruption in the base budgets. Contracting personnel would be cut, resulting in delays in the contracts and the contract oversight that support the war. Payroll personnel would be cut, resulting in late payments to wartime vendors, and legal and policy support would be disrupted. Unfortunately, while large cuts are being imposed, the threats to national security would not be reduced. As a result, we would have to formulate a new security strategy that accepted substantial risk of not meeting our defense needs. A sequestration budget is not one that I could recommend. I ask that you join with all members of Congress to meet the critical need for deficit reduction without resorting either to sequestration or to further cuts in the caps on discretionary funding. An identical letter has been sent to Senator Graham. o The national defense budget caps would be lowered sharply for FY 2014 through FY 2021. · The lowered caps would have major effects on defense in FY 2013 and beyond. The effects in FY 2013 would be especially severe because of the manner in which the cuts must be applied under current law. · As a result, beyond the over $450 billion in cuts already levied on the Department under the basic provisions of the Budget Control Act (BCA), DoD would be faced with an additional $500-$600 billion in cuts under sequester. · If the Joint Committee fails to achieve any deficit reduction (the worst case), and if the President utilizes his authority to exempt military personnel funding, then we estimate that the remainder of the FY 2013 defense budget would be cut by about $100 billion, about 23 percent compared with the President's FY 2012 budget plan now on the Hill -and roughly double the cuts under the basic BCA provisions. o We could not afford to exempt major weapon programs (Joint Strike Fighter, P-8 aircraft, ground combat vehicle, ships) from cuts. Reductions would delay receipt of capability and drive up unit costs. o We could not exempt all our civilian personnel. Furloughs -perhaps a month or more -might well be needed because there would not be time to reduce personnel levels to achieve savings. o We could not exempt funding directly related to readiness and maintain a balanced force. We would have to look at reductions in training. · Absent Congressional approval, current law does not provide flexibility. It dictates that sequester cuts must be applied in equal percentages to each "program, project, and activity." o That means equal percentage cuts in every weapons program, research project, and military construction project. Ø A 23 percent cut in ship and military construction projects would render them unexecutable - you cannot buy three quarters of a building. Ø A 23 percent cut in weapons program would drive up unit costs and lead to reductions in quantity of one third or more. o The day-to-day appropriation (operation and maintenance) is reduced at the account level, which offers modestly more flexibility. But the furloughs and training cuts mentioned above would still be needed. · Funds for Overseas Contingency Operations (OCO) are fully exempt from the sequester, so added costs for wartime operations would not be affected. o But OCO funding assumes that the base budget is fully funded. o The severe disruption in the base budget would have adverse effect on our ability to support the Afghan war. Contracts would be late, payrolls would be delayed, legal and policy support would be disrupted. · A sequester would lower the caps on defense spending by about $100 billion a year in FY 2013 through 2021 - roughly double the effects of cuts under the basic provisions of the BCA. These reductions in defense spending would have devastating effects. o Undermine our ability to meet our national security objectives and require a significant revision to our defense strategy. o Generate significant operational risks: delays response time to crises, conflicts, and disasters; severely limits our ability to be forward deployed and engaged around the world; and assumes unacceptable risk in future combat operations. o Severely reduce force training - threatens overall operational readiness. o The smallest ground force since 1940.
o A fleet of fewer than 230 ships, the smallest level since 1915.
o The smallest tactical fighter force in the history of the Air Force. · Reductions of 20 percent ($150 billion over ten years) in civilian personnel would lead to the smallest civilian workforce since DoD became a Department. o Eliminate ICBM leg of Triad ($8B). Hello There. I found your blog using msn. That is a really well written article. I will be sure to bookmark it and come back to read extra of your helpful info. Thank you for the post. I'll certainly return. If we eliminate the building of just 1 (one) more bomber or super tank, I wonder how many school systems could we vastly improve and and give our kids a chance to compete world wide. And cut the cost of advanced ed to something affordable that benefit many, instead of a few in the War industry.